Available for Yamaha, Kawasaki and many other ignition coils. DON'T BUY A NEW IGNITION COIL! THE PLUG WIRES AND TERMINALS ARE THE PROBLEM! Custom lengths no problem, just specify your desired length. Wire is available in BLACK BLUE & RED 8mm fiberglass reinforced silicone, fine stranded silver tinned wire core. 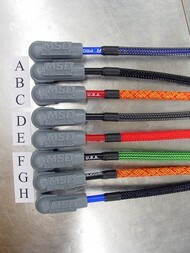 MSD stainless terminals and silicone boots. For Yamaha, terminal end is epoxy sealed to prevent metal dust from working into the strands of wire, extending cable life. We also have high quality neoprene sleeving available, which is typical OEM type cable protection, if you prefer it over braid. 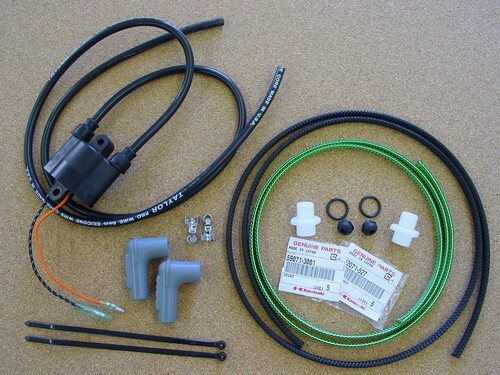 For Kawasaki, send the coil only, you can cut the old wires off.